A server/client system for processing data includes a network having a web server with information accessible remotely. A client device includes a microphone and a rendering component such as a speaker or display. The client device is configured to obtain the information from the web server and record input data associated with fields contained in the information. The client device is adapted to send the input data to a remote location with an indication of a grammar to use for recognition. A recognition server receives the input data and the indication of the grammar. The recognition server returns data indicative of what was recognized to at least one of the client and the web server. This application claims the benefit of U.S. provisional patent application No. 60/289,041, filed May 4, 2001. A server/client system for processing data includes a network having a web server with information accessible remotely. A client device includes a microphone and a rendering component such as a speaker or display. The client device is configured to obtain the information from the web server and record input data associated with fields contained in the information. The client device is adapted to send the input data to a remote location with an indication of a grammar to use for recognition. A recognition server receives the input data and the indication of the grammar. The recognition server returns data indicative of what was inputted to at least one of the client and the web server. FIG. 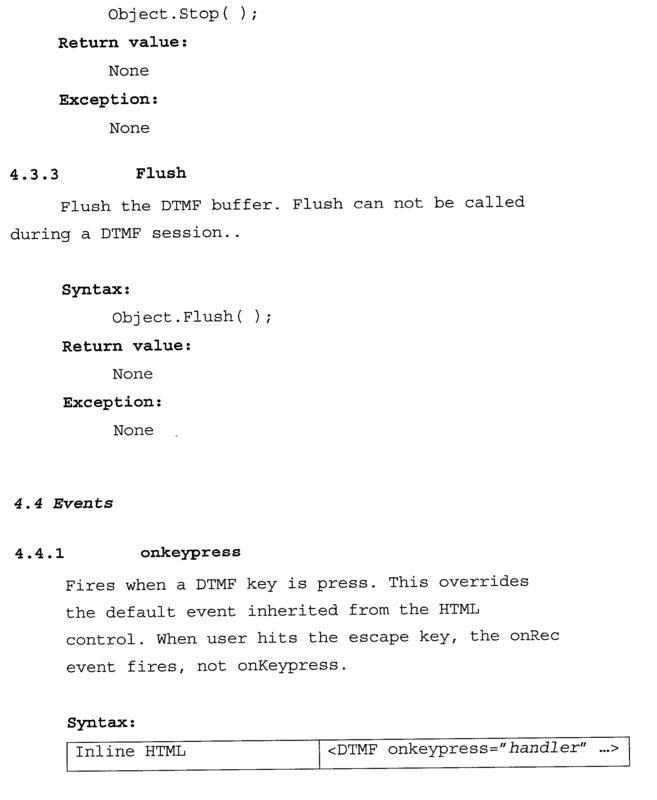 14 is a pictorial illustration of a third operational mode of the recognition server. Before describing an architecture of web based recognition and methods for implementing the same, it may be useful to describe generally computing devices that can function in the architecture. Referring now to FIG. 1, an exemplary form of a data management device (PIM, PDA or the like) is illustrated at  30. However, it is contemplated that the present invention can also be practiced using other computing devices discussed below, and in particular, those computing devices having limited surface areas for input buttons or the like. For example, phones and/or data management devices will also benefit from the present invention. Such devices will have an enhanced utility compared to existing portable personal information management devices and other portable electronic devices, and the functions and compact size of such devices will more likely encourage the user to carry the device at all times. Accordingly, it is not intended that the scope of the architecture herein described be limited by the disclosure of an exemplary data management or PIM device, phone or computer herein illustrated. An exemplary form of a data management mobile device  30 is illustrated in FIG. 1. The mobile device 30 includes a housing 32 and has an user interface including a display 34, which uses a contact sensitive display screen in conjunction with a stylus 33. The stylus 33 is used to press or contact the display 34 at designated coordinates to select a field, to selectively move a starting position of a cursor, or to otherwise provide command information such as through gestures or handwriting. Alternatively, or in addition, one or more buttons 35 can be included on the device 30 for navigation. In addition, other input mechanisms such as rotatable wheels, rollers or the like can also be provided. However, it should be noted that the invention is not intended to be limited by these forms of input mechanisms. For instance, another form of input can include a visual input such as through computer vision. Referring now to FIG. 2, a block diagram illustrates the functional components comprising the mobile device  30. A central processing unit (CPU) 50 implements the software control functions. CPU 50 is coupled to display 34 so that text and graphic icons generated in accordance with the controlling software appear on the display 34. A speaker 43 can be coupled to CPU 50 typically with a digital-to-analog converter 59 to provide an audible output. Data that is downloaded or entered by the user into the mobile device 30 is stored in a non-volatile read/write random access memory store 54 bi-directionally coupled to the CPU 50. Random access memory (RAM) 54 provides volatile storage for instructions that are executed by CPU 50, and storage for temporary data, such as register values. Default values for configuration options and other variables are stored in a read only memory (ROM) 58. ROM 58 can also be used to store the operating system software for the device that controls the basic functionality of the mobile 30 and other operating system kernel functions (e.g., the loading of software components into RAM 54). RAM  54 also serves as a storage for the code in the manner analogous to the function of a hard drive on a PC that is used to store application programs. It should be noted that although non-volatile memory is used for storing the code, it alternatively can be stored in volatile memory that is not used for execution of the code. Wireless signals can be transmitted/received by the mobile device through a wireless transceiver  52, which is coupled to CPU 50. An optional communication interface 60 can also be provided for downloading data directly from a computer (e.g., desktop computer), or from a wired network, if desired. Accordingly, interface 60 can comprise various forms of communication devices, for example, an infrared link, modem, a network card, or the like. Mobile device  30 includes a microphone 29, and analog-to-digital (A/D) converter 37, and an optional recognition program (speech, DTMF, handwriting, gesture or computer vision) stored in store 54. By way of example, in response to audible information, instructions or commands from a user of device 30, microphone 29 provides speech signals, which are digitized by A/D converter 37. The speech recognition program can perform normalization and/or feature extraction functions on the digitized speech signals to obtain intermediate speech recognition results. Using wireless transceiver 52 or communication interface 60, speech data is transmitted to a remote recognition server 204 discussed below and illustrated in the architecture of FIG. 5. Recognition results are then returned to mobile device 30 for rendering (e.g. visual and/or audible) thereon, and eventual transmission to a web server 202 (FIG. 5), wherein the web server 202 and mobile device 30 operate in a client/server relationship. Similar processing can be used for other forms of input. For example, handwriting input can be digitized with or without pre-processing on device 30. Like the speech data, this form of input can be transmitted to the recognition server 204 for recognition wherein the recognition results are returned to at least one of the device 30 and/or web server 202. Likewise, DTMF data, gesture data and visual data can be processed similarly. Depending on the form of input, device 30 (and the other forms of clients discussed below) would include necessary hardware such as a camera for visual input. FIG. 3 is a plan view of an exemplary embodiment of a portable phone 80. The phone 80 includes a display 82 and a keypad 84. Generally, the block diagram of FIG. 2 applies to the phone of FIG. 3, although additional circuitry necessary to perform other functions may be required. For instance, a transceiver necessary to operate as a phone will be required for the embodiment of FIG. 2; however, such circuitry is not pertinent to the present invention. The following is a brief description of a general purpose computer  120 illustrated in FIG. 4. However, the computer 120 is again only one example of a suitable computing environment and is not intended to suggest any limitation as to the scope of use or functionality of the invention. Neither should the computer 120 be interpreted as having any dependency or requirement relating to any one or combination of components illustrated therein. With reference to FIG. 4, components of computer  120 may include, but are not limited to, a processing unit 140, a system memory 150, and a system bus 141 that couples various system components including the system memory to the processing unit 140. The system bus 141 may be any of several types of bus structures including a memory bus or memory controller, a peripheral bus, and a local bus using any of a variety of bus architectures. By way of example, and not limitation, such architectures include Industry Standard Architecture (ISA) bus, Universal Serial Bus (USB), Micro Channel Architecture (MCA) bus, Enhanced ISA (EISA) bus, Video Electronics Standards Association (VESA) local bus, and Peripheral Component Interconnect (PCI) bus also known as Mezzanine bus. Computer 120 typically includes a variety of computer readable mediums. Computer readable mediums can be any available media that can be accessed by computer 120 and includes both volatile and nonvolatile media, removable and non-removable media. By way of example, and not limitation, computer readable mediums may comprise computer storage media and communication media. Computer storage media includes both volatile and nonvolatile, removable and non-removable media implemented in any method or technology for storage of information such as computer readable instructions, data structures, program modules or other data. Computer storage media includes, but is not limited to, RAM, ROM, EEPROM, flash memory or other memory technology, CD-ROM, digital versatile disks (DVD) or other optical disk storage, magnetic cassettes, magnetic tape, magnetic disk storage or other magnetic storage devices, or any other medium which can be used to store the desired information and which can be accessed by computer 120. The system memory  150 includes computer storage media in the form of volatile and/or nonvolatile memory such as read only memory (ROM) 151 and random access memory (RAM) 152. 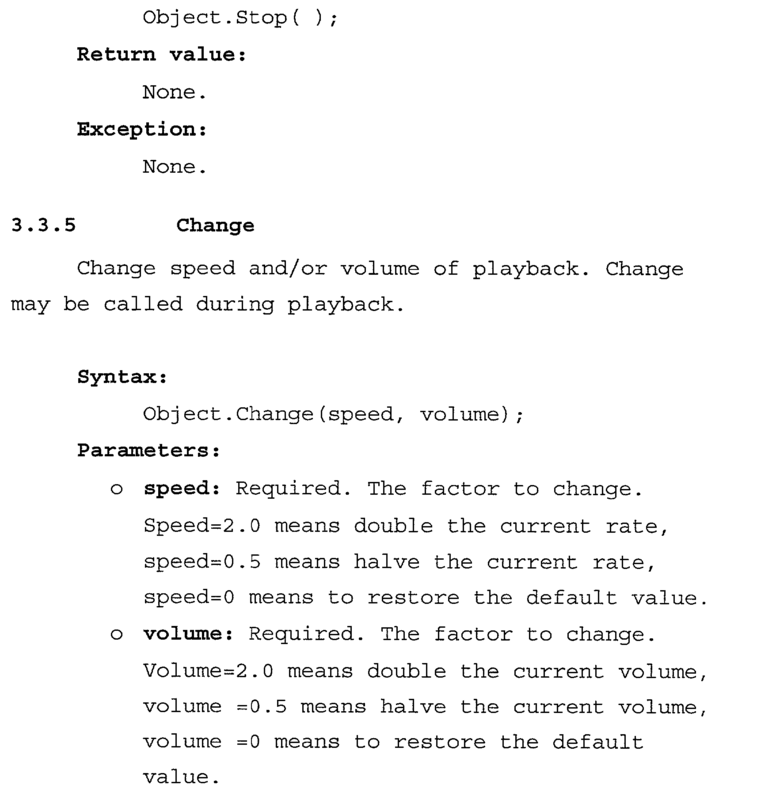 A basic input/output system 153 (BIOS), containing the basic routines that help to transfer information between elements within computer 120, such as during start-up, is typically stored in ROM 151. RAM 152 typically contains data and/or program modules that are immediately accessible to and/or presently being operated on by processing unit 140. By way of example, and not limitation, FIG. 4 illustrates operating system 54, application programs 155, other program modules 156, and program data 157. The computer  120 may also include other removable/non-removable volatile/nonvolatile computer storage media. By way of example only, FIG. 4 illustrates a hard disk drive 161 that reads from or writes to non-removable, nonvolatile magnetic media, a magnetic disk drive 171 that reads from or writes to a removable, nonvolatile magnetic disk 172, and an optical disk drive 175 that reads from or writes to a removable, nonvolatile optical disk 176 such as a CD ROM or other optical media. Other removable/non-removable, volatile/nonvolatile computer storage media that can be used in the exemplary operating environment include, but are not limited to, magnetic tape cassettes, flash memory cards, digital versatile disks, digital video tape, solid state RAM, solid state ROM, and the like. The hard disk drive 161 is typically connected to the system bus 141 through a non-removable memory interface such as interface 160, and magnetic disk drive 171 and optical disk drive 175 are typically connected to the system bus 141 by a removable memory interface, such as interface 170. The drives and their associated computer storage media discussed above and illustrated in FIG. 4, provide storage of computer readable instructions, data structures, program modules and other data for the computer  120. In FIG. 4, for example, hard disk drive 161 is illustrated as storing operating system 164, application programs 165, other program modules 166, and program data 167. Note that these components can either be the same as or different from operating system 154, application programs 155, other program modules 156, and program data 157. Operating system 164, application programs 165, other program modules 166, and program data 167 are given different numbers here to illustrate that, at a minimum, they are different copies. A user may enter commands and information into the computer  120 through input devices such as a keyboard 182, a microphone 183, and a pointing device 181, such as a mouse, trackball or touch pad. Other input devices (not shown) may include a joystick, game pad, satellite dish, scanner, or the like. These and other input devices are often connected to the processing unit 140 through a user input interface 180 that is coupled to the system bus, but may be connected by other interface and bus structures, such as a parallel port, game port or a universal serial bus (USB). A monitor 184 or other type of display device is also connected to the system bus 141 via an interface, such as a video interface 185. In addition to the monitor, computers may also include other peripheral output devices such as speakers 187 and printer 186, which may be connected through an output peripheral interface 188. The computer  120 may operate in a networked environment using logical connections to one or more remote computers, such as a remote computer 194. The remote computer 194 may be a personal computer, a hand-held device, a server, a router, a network PC, a peer device or other common network node, and typically includes many or all of the elements described above relative to the computer 120. The logical connections depicted in FIG. 4 include a local area network (LAN) 191 and a wide area network (WAN) 193, but may also include other networks. Such networking environments are commonplace in offices, enterprise-wide computer networks, intranets and the Internet. When used in a LAN networking environment, the computer  120 is connected to the LAN 191 through a network interface or adapter 190. When used in a WAN networking environment, the computer 120 typically includes a modem 192 or other means for establishing communications over the WAN 193, such as the Internet. The modem 192, which may be internal or external, may be connected to the system bus 141 via the user input interface 180, or other appropriate mechanism. In a networked environment, program modules depicted relative to the computer 120, or portions thereof, may be stored in the remote memory storage device. By way of example, and not limitation, FIG. 4 illustrates remote application programs 195 as residing on remote computer 194. It will be appreciated that the network connections shown are exemplary and other means of establishing a communications link between the computers may be used. FIG. 5 illustrates architecture  200 for web based recognition as can be embodied in the present invention. Generally, information stored in a web server 202 can be accessed through mobile device 30 (which herein also represents other forms of computing devices having a display screen, a microphone, a camera, a touch sensitive panel, etc., as required based on the form of input), or through phone 80 wherein information is requested audibly or through tones generated by phone 80 in response to keys depressed and wherein information from web server 202 is provided only audibly back to the user. More importantly though, architecture  200 is unified in that whether information is obtained through device 30 or phone 80 using speech recognition, a single recognition server 204 can support either mode of operation. In addition, architecture 200 operates using an extension of well-known mark-up languages (e.g. 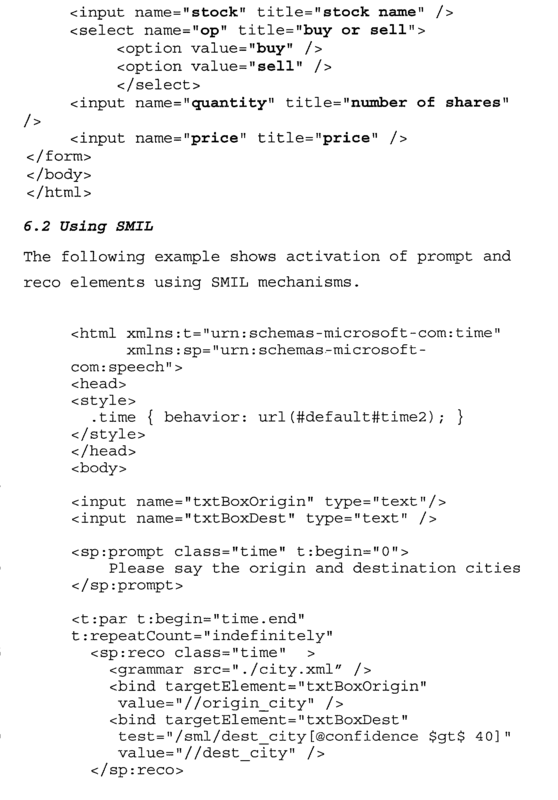 HTML, XHTML, cHTML, XML, WML, and the like). Thus, information stored on web server 202 can also be accessed using well-known GUI methods found in these mark-up languages. By using an extension of well-known mark-up languages, authoring on the web server 202 is easier, and legacy applications currently existing can be also easily modified to include voice recognition. 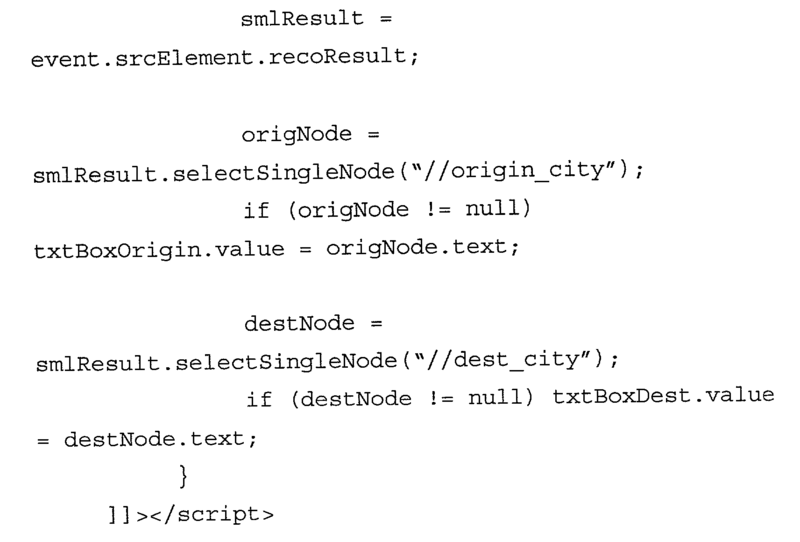 Generally, device  30 executes HTML+ scripts, or the like, provided by web server 202. 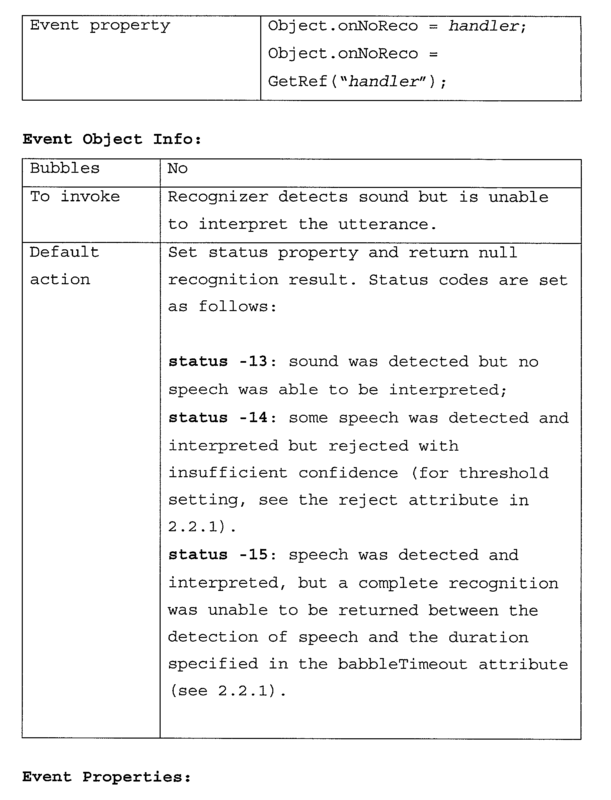 When voice recognition is required, by way of example, speech data, which can be digitized audio signals or speech features wherein the audio signals have been preprocessed by device 30 as discussed above, are provided to recognition server 204 with an indication of a grammar or language model to use during speech recognition. The implementation of the recognition server 204 can take many forms, one of which is illustrated, but generally includes a recognizer 211. 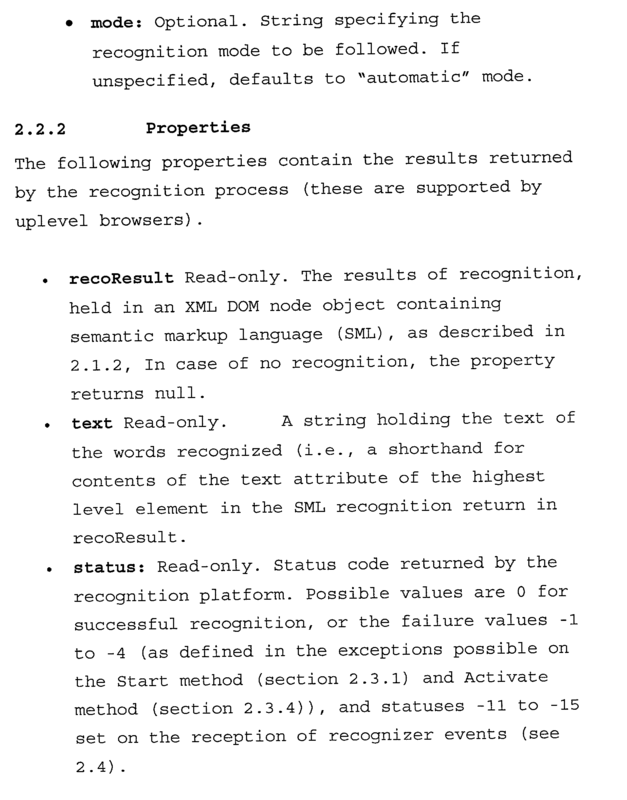 The results of recognition are provided back to device 30 for local rendering if desired or appropriate. Upon compilation of information through recognition and any graphical user interface if used, device 30 sends the information to web server 202 for further processing and receipt of further HTML scripts, if necessary. As illustrated in FIG. 5, device  30, web server 202 and recognition server 204 are commonly connected, and separately addressable, through a network 205, herein a wide area network such as the Internet. It therefore is not necessary that any of these devices be physically located adjacent each other. In particular, it is not necessary that web server 202 includes recognition server 204. In this manner, authoring at web server 202 can be focused on the application to which it is intended without the authors needing to know the intricacies of recognition server 204. Rather, recognition server 204 can be independently designed and connected to the network 205, and thereby, be updated and improved without further changes required at web server 202. As discussed below, web server 202 can also include an authoring mechanism that can dynamically generate client-side markups and scripts. In a further embodiment, the web server 202, recognition server 204 and client 30 may be combined depending on the capabilities of the implementing machines. For instance, if the client comprises a general purpose computer, e.g. a personal computer, the client may include the recognition server 204. Likewise, if desired, the web server 202 and recognition server 204 can be incorporated into a single machine. Access to web server  202 through phone 80 includes connection of phone 80 to a wired or wireless telephone network 208, that in turn, connects phone 80 to a third party gateway 210. Gateway 210 connects phone 80 to a telephony voice browser 212. Telephone voice browser 212 includes a media server 214 that provides a telephony interface and a voice browser 216. Like device 30, telephony voice browser 212 receives HTML scripts or the like from web server 202. 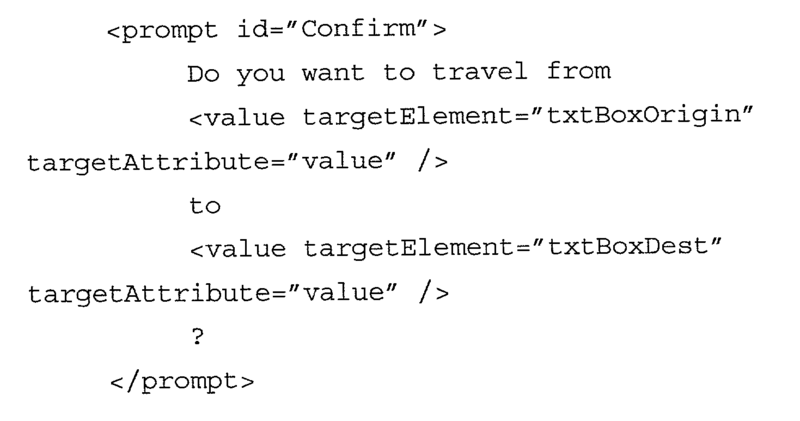 More importantly though, the HTML scripts are of the form similar to HTML scripts provided to device 30. In this manner, web server 202 need not support device 30 and phone 80 separately, or even support standard GUI clients separately. Rather, a common mark-up language can be used. In addition, like device 30, voice recognition from audible signals transmitted by phone 80 are provided from voice browser 216 to recognition server 204, either through the network 205, or through a dedicated line 207, for example, using TCP/IP. Web server 202, recognition server 204 and telephone voice browser 212 can be embodied in any suitable computing environment such as the general purpose desktop computer illustrated in FIG. 4. However, it should be noted that if DTMF recognition is employed, this form of recognition would generally be performed at the media server  214, rather than at the recognition server 204. 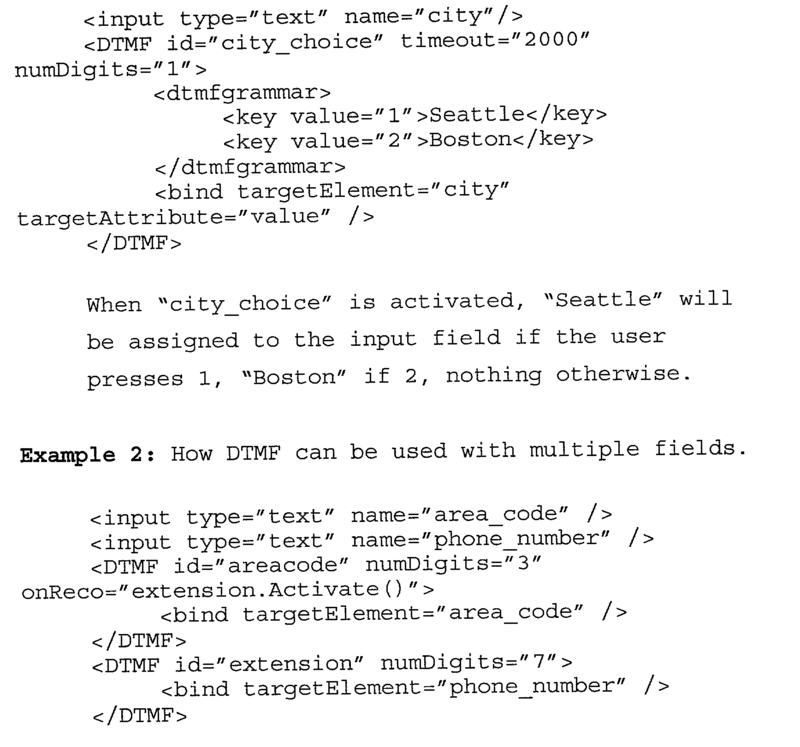 In other words, the DTMF grammar would be used by the media server. Generally, controls and/or objects can include one or more of the following functions: recognizer controls and/or objects for recognizer configuration, recognizer execution and/or post-processing; synthesizer controls and/or objects for synthesizer configuration and prompt playing; grammar controls and/or objects for specifying input grammar resources; and/or binding controls and/or objects for processing recognition results. The extensions are designed to be a lightweight markup layer, which adds the power of an audible, visual, handwriting, etc. interface to existing markup languages. As such, the extensions can remain independent of: the high-level page in which they are contained, e.g. HTML; the low-level formats which the extensions used to refer to linguistic resources, e.g. 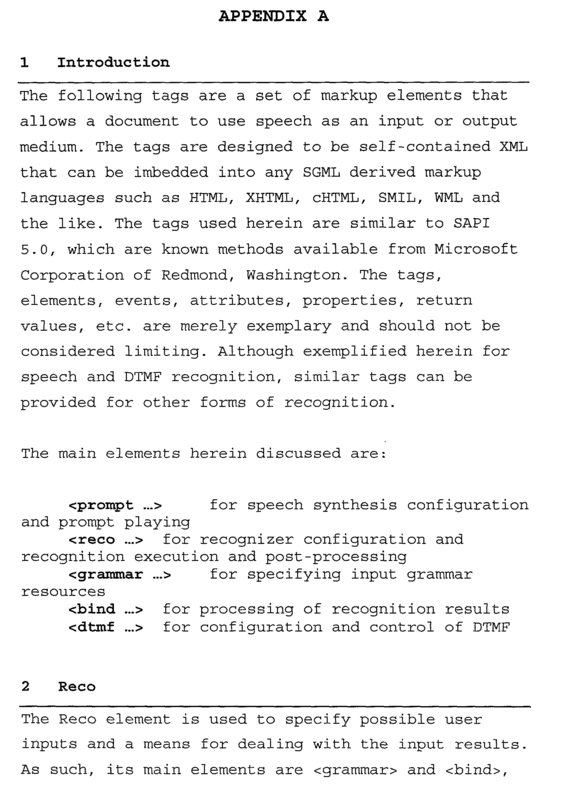 the text-to-speech and grammar formats; and the individual properties of the recognition and speech synthesis platforms used in the recognition server  204. 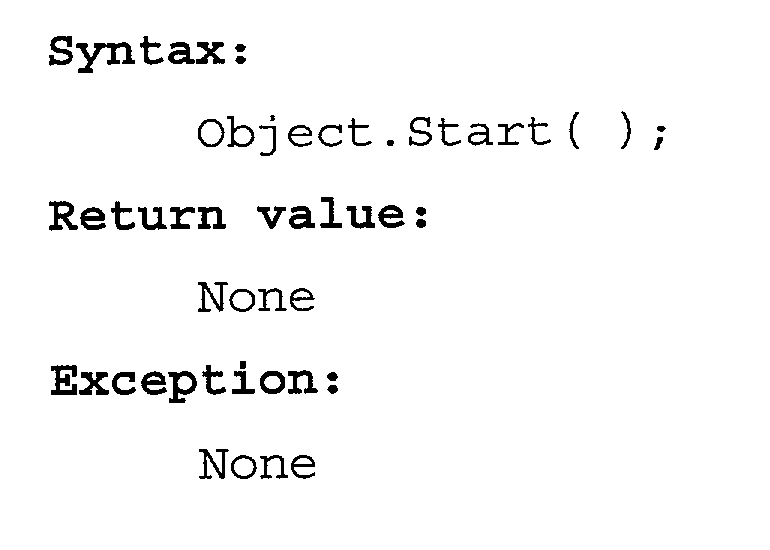 Before describing mark-up languages having controls and/or objects suited for recognition, it may be helpful to examine a simple GUI example herein embodied with the HTML mark-up language. Referring to FIG. 6, a simple GUI interface comprises submission of credit card information to the web server to complete an on-line sale. In this example, the credit card information includes a field  250 for entry of the type of credit card being used, for example, Visa, MasterCard or American Express. A second field 252 allows entry of the credit card number, while a third field 254 allows entry of the expiration date. Submit button 264 is provided to transmit the information entered in fields 250, 252 and 254. FIG. 7 illustrates the HTML code for obtaining the foregoing credit card information from the client. Generally, as is common in these forms of mark-up languages, the code includes a body portion  260 and a script portion 262. The body portion 260 includes lines of code indicating the type of action to be performed, the form to use, the various fields of information 250, 252 and 254, as well as a code for submit button 264 (FIG. 6). 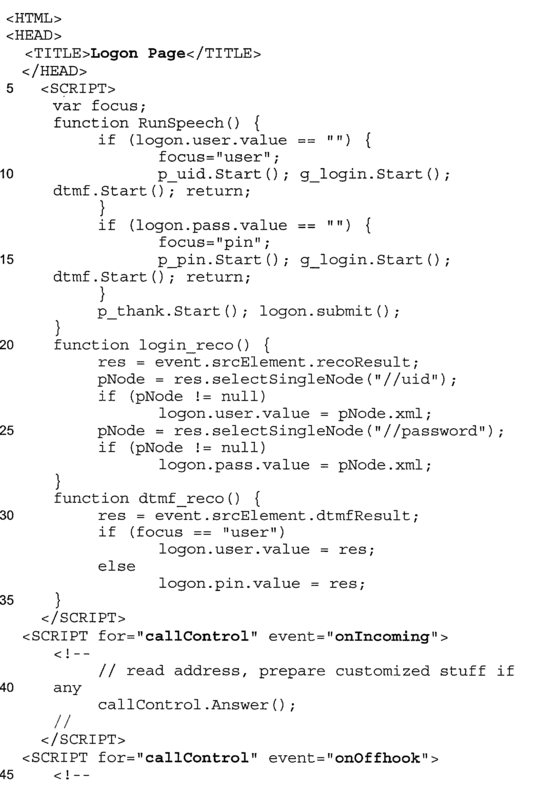 This example also illustrates eventing support and embedded script hosting, wherein upon activation of the submit button 264, a function “verify” is called or executed in script portion 262. The “verify” function ascertains whether the card number length for each of the credit cards (Visa, MasterCard and American Express) is of the proper length. FIG. 8 illustrates a client markup that generates the same GUI of FIG. 6 for obtaining credit card information to be provided to web server  204 using speech recognition. Although speech recognition will be discussed below with respect to FIGS. 8-14, it should be understood that the techniques described can be similarly applied in handwriting recognition, gesture recognition and image recognition. At this point though, a particular mode of entry should be discussed. In particular, use of speech recognition in conjunction with at least a display and, in a further embodiment, a pointing device as well to indicate the fields for data entry is particularly useful. Specifically, in this mode of data entry, the user is generally under control of when to select a field and provide corresponding information. For instance, in the example of FIG. 6, a user could first decide to enter the credit card number in field  252 and then enter the type of credit card in field 250 followed by the expiration date in field 254. Likewise, the user could return back to field 252 and correct an errant entry, if desired. When combined with speech recognition as described below, an easy and natural form of navigation is provided. As used herein, this form of entry using both a screen display allowing free form selection of fields and voice recognition is called “multi-modal”. Referring back to FIG. 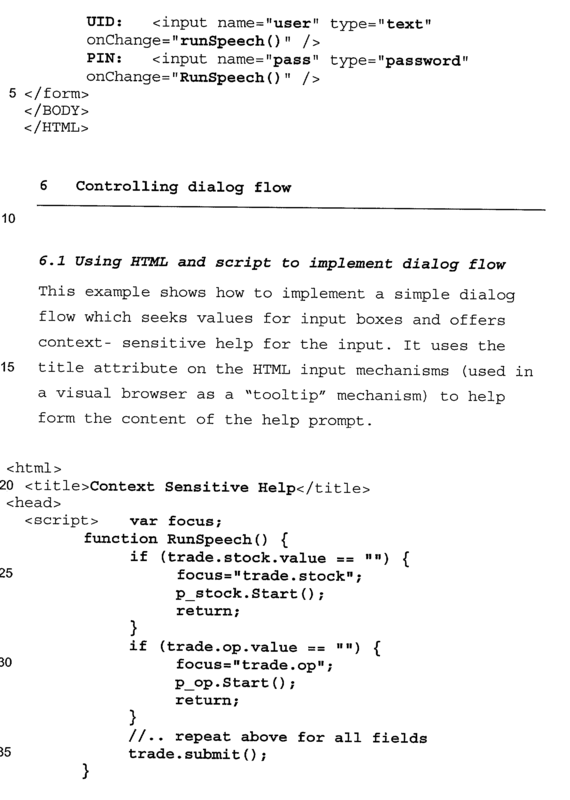 8, HTML mark-up language code is illustrated. Like the HTML code illustrated in FIG. 7, this code also includes a body portion  270 and a script portion 272. Also like the code illustrated in FIG. 7, the code illustrated in FIG. 8 includes indications as to the type of action to perform as well as the location of the form. Entry of information in each of the fields 250, 252 and 254 is controlled or executed by code portions 280, 282 and 284, respectively. 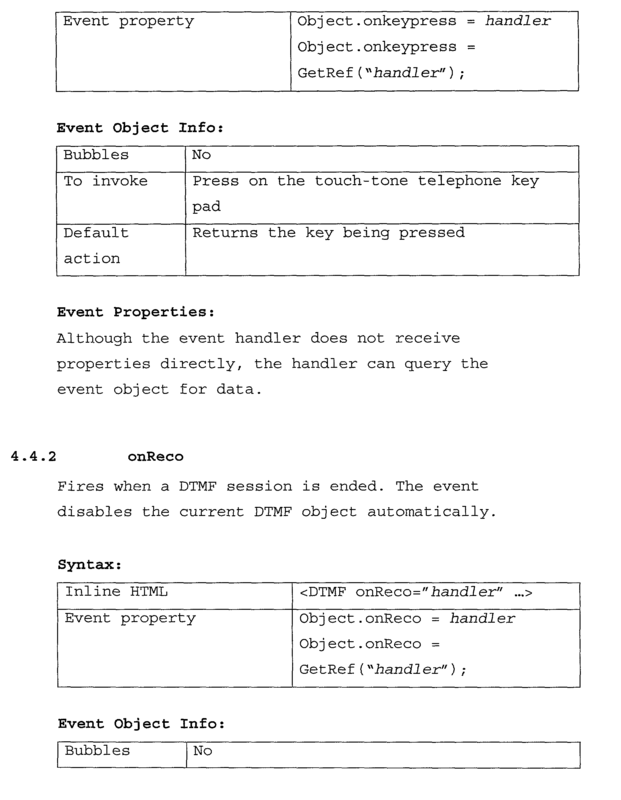 Referring first to code portion 280, on selection of field 250, for example, by use of stylus 33 of device 30, the event “onClick” is initiated which calls or executes function “talk” in script portion 272. This action activates a grammar used for speech recognition that is associated with the type of data generally expected in field 250. This type of interaction, which involves more than one technique of input (e.g. voice and pen-click/roller) is referred as “multimodal”. Referring now back to the grammar, the grammar is a syntactic grammar such as but not limited to a context-free grammar, a N-grammar or a hybrid grammar. (Of course, DTMF grammars, handwriting grammars, gesture grammars and image grammars would be used when corresponding forms of recognition are employed. 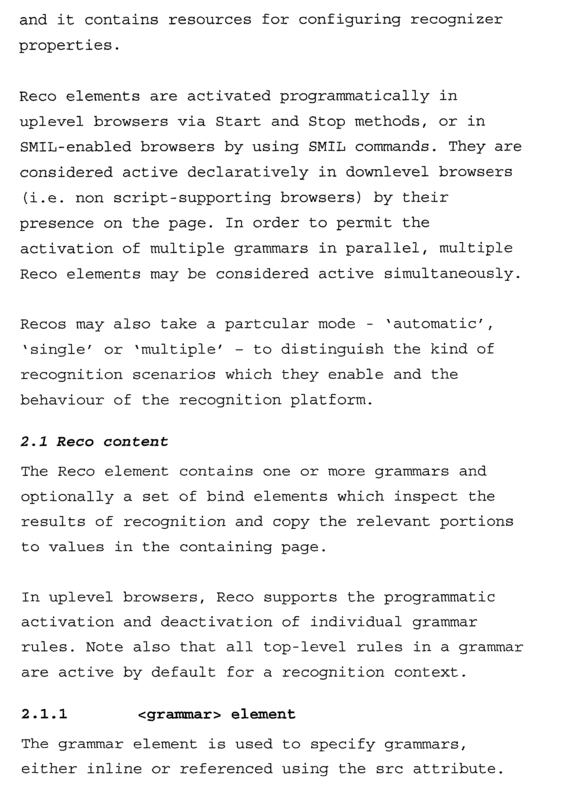 As used herein, a “grammar” includes information for performing recognition, and in a further embodiment, information corresponding to expected input to be entered, for example, in a specific field) A new control  290 (herein identified as “reco”), comprising a first extension of the mark-up language, includes various elements, two of which are illustrated, namely a grammar element “grammar” and a “bind” element. Generally, like the code downloaded to a client from web server 202, the grammars can originate at web server 202 and be downloaded to the client and/or forwarded to a remote server for speech processing. The grammars can then be stored locally thereon in a cache. Eventually, the grammars are provided to the recognition server 204 for use in recognition. The grammar element is used to specify grammars, either inline or referenced using an attribute. Upon receipt of recognition results from recognition server  204 corresponding to the recognized speech, handwriting, gesture, image, etc., syntax of reco control 290 is provided to receive the corresponding results and associate it with the corresponding field, which can include rendering of the text therein on display 34. 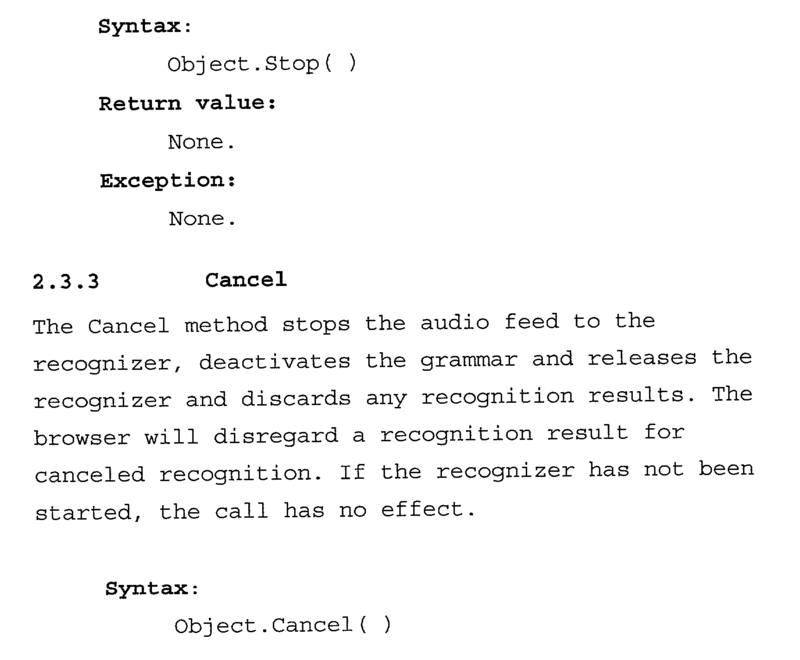 In the illustrated embodiment, upon completion of speech recognition with the result sent back to the client, it deactivates the reco object and associates the recognized text with the corresponding field. Portions 282 and 284 operate similarly wherein unique reco objects and grammars are called for each of the fields 252 and 254 and upon receipt of the recognized text is associated with each of the fields 252 and 254. With respect to receipt of the card number field 252, the function “handle” checks the length of the card number with respect to the card type in a manner similar to that described above with respect to FIG. 7. 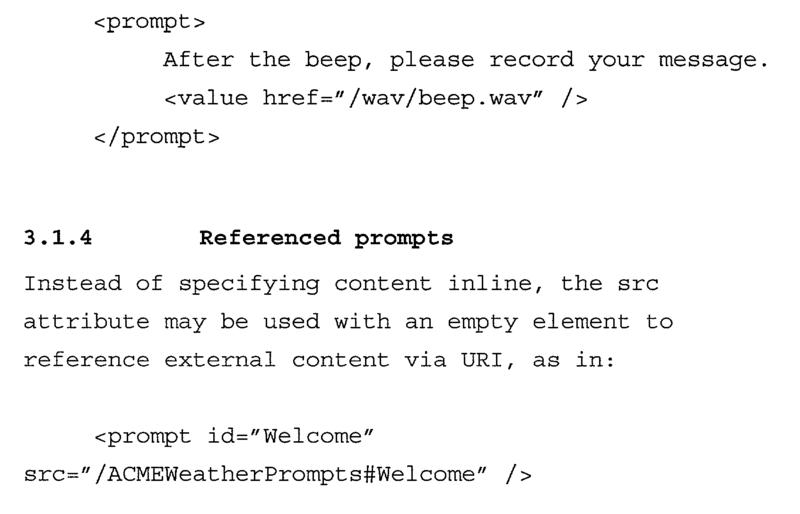 Generally, use of speech recognition in conjunction with architecture  200 and the client side mark-up language occurs as follows: first, the field that is associated with the speech to be given is indicated. In the illustrated embodiment, the stylus 33 is used; however, it should be understood that the present invention is not limited to use of the stylus 33 wherein any form of indication can be used such as buttons, a mouse pointer, rotatable wheels or the like. Corresponding event such as “onClick” can be provided as is well known with use of visual mark-up languages. It should be understood that the present invention is not limited to the use of the “onClick” event to indicate the start of voice, handwriting, gesture, etc commands. Any available GUI event can be used for the same purpose as well, such as “onSelect”. In one embodiment, such eventing is particularly useful for it serves to indicate both the beginning and/or end of the corresponding speech. It should also be noted that the field for which the speech is directed at can be indicated by the user as well as programs running on the browser that keep track of user interactions. At this point, it should be stated that different scenarios of speech recognition require different behaviors and/or outputs from recognition server  204. Although the starting of the recognition process is standard in all cases—an explicit start ( ) call from uplevel browsers, or a declarative <reco> element in downlevel browsers—the means for stopping speech recognition may differ. In the example above, a user in a multimodal application will control input into the device by, for example, tapping and holding on a pressure sensitive display. 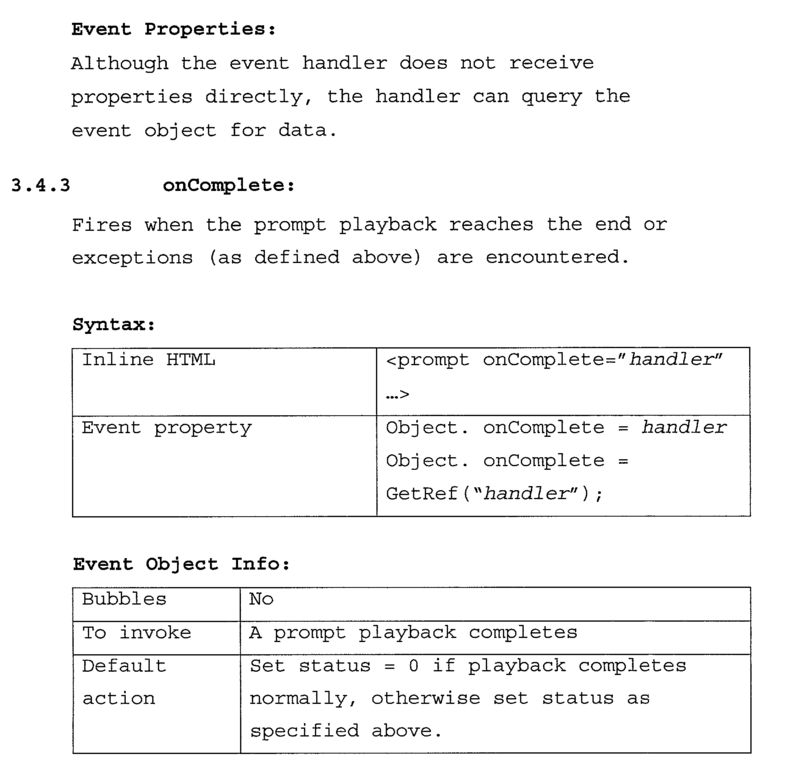 The browser then uses a GUI event, e.g. “pen-up”, to control when recognition should stop and then returns the corresponding results. 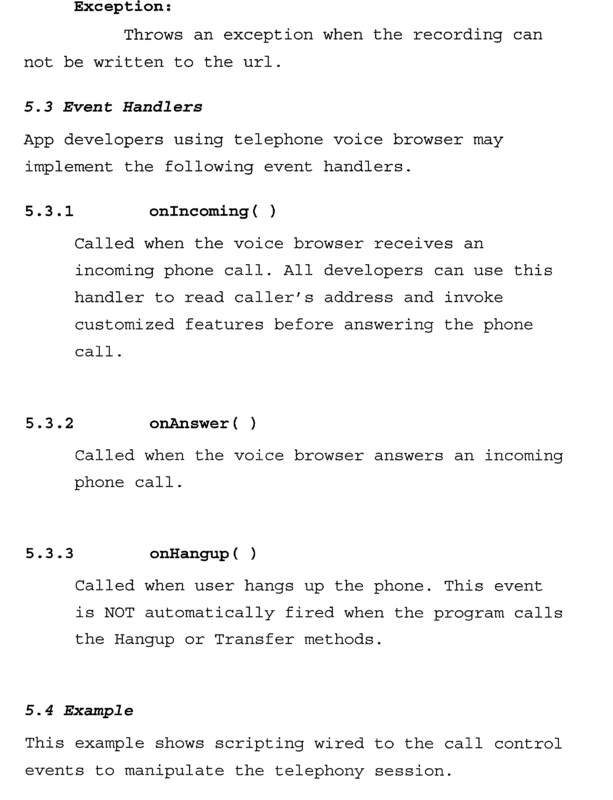 However, in a voice-only scenario such as in a telephone application (discussed below) or in a hands-free application, the user has no direct control over the browser, and the recognition server  204 or the client 30, must take the responsibility of deciding when to stop recognition and return the results (typically once a path through the grammar has been recognized). 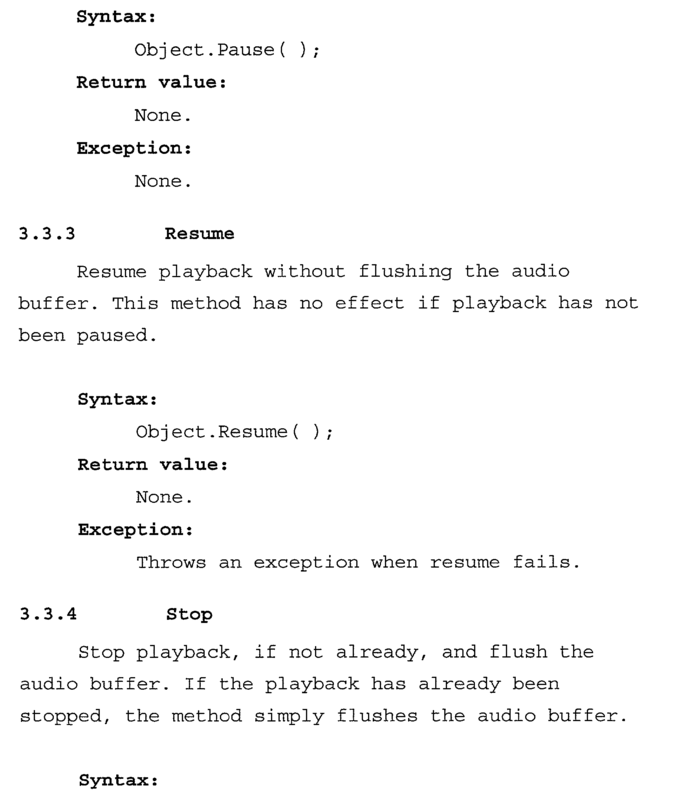 Further, dictation and other scenarios where intermediate results need to be returned before recognition is stopped (also known as “open microphone”) not only requires an explicit stop function, but also needs to return multiple recognition results to the client 30 and/or web server 202 before the recognition process is stopped. In one embodiment, the Reco element can include a “mode” attribute to distinguish the following three modes of recognition, which instruct the recognition server  204 how and when to return results. 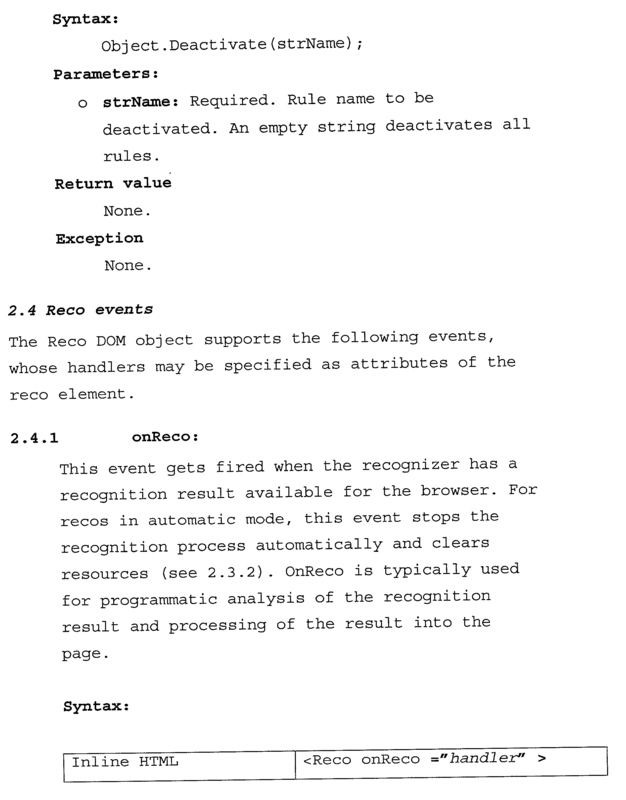 The return of results implies providing the “onReco” event or activating the “bind” elements as appropriate. In one embodiment, if the mode is unspecified, the default recognition mode can be “automatic”. FIG. 12 is a pictorial representation of operation of the “automatic” mode for speech recognition (similar modes, events, etc. can be provided for other forms of recognition). A timeline  281 indicates when the recognition server 204 is directed to begin recognition at 283, and where the recognition server 204 detects speech at 285 and determines that speech has ended at 287. 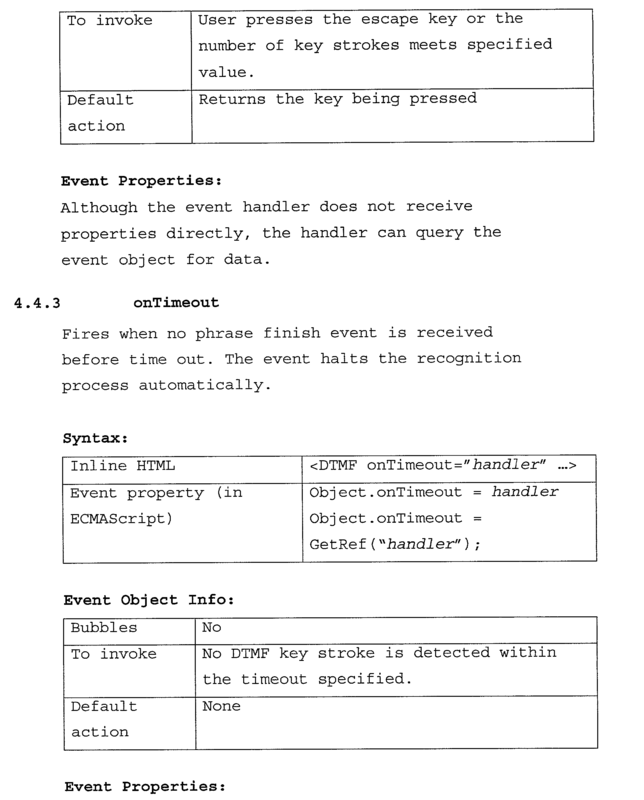 Various attributes of the Reco element control behavior of the recognition server  204. The attribute “initialTimeout” 289 is the time between the start of recognition 283 and the detection of speech 285. If this time period is exceeded, “onSilence” event 291 will be provided from the recognition server 204, signaling that recognition has stopped. If the recognition server 204 finds the utterance to be unrecognizable, an “onNoReco” event 293 will be issued, which will also indicate that recognition has stopped. Other attributes that can stop or cancel recognition include a “babbleTimeout” attribute  295, which is the period of time in which the recognition server 204 must return a result after detection of speech at 285. If exceeded, different events are issued according to whether an error has occurred or not. If the recognition server 204 is still processing audio, for example, in the case of an exceptionally long utterance, the “onNoReco” attribute 293 is issued. However, if the “babbleTimeout” attribute 295 is exceeded for any other reason, a recognizer error is more likely and an “onTimeout” event 297 is issued. Likewise, a “maxTimeout” attribute 299 can also be provided and is for the period of time between the start of recognition 283 and the results returned to the client 30. If this time period is exceeded, the “onTimeout” event 297 is issued. If, however, a time period greater than an “endSilence” attribute  301 is exceeded, implying that recognition is complete, the recognition server 204 automatically stops recognition and returns its results. It should be noted that the recognition server 204 can implement a confidence measure to determine if the recognition results should be returned. If the confidence measure is below a threshold, the “onNoReco” attribute 293 is issued, whereas if the confidence measure is above the threshold a “onNoReco” attribute 303 and the results of recognition are issued. FIG. 12 thereby illustrates that in “automatic mode” no explicit stop ( ) calls are made. FIG. 13 pictorially illustrates “single mode” operation of the recognition server  204. Attributes and events described above with respect to the “automatic mode” are applicable and are so indicated with the same reference numbers. However, in this mode of operation, a stop ( ) call 305 is indicated on timeline 281. The stop ( ) call 305 would correspond to an event such as “pen-up” by the user. In this mode of operation, the return of a recognition result is under the control of the explicit stop ( ) call 305. 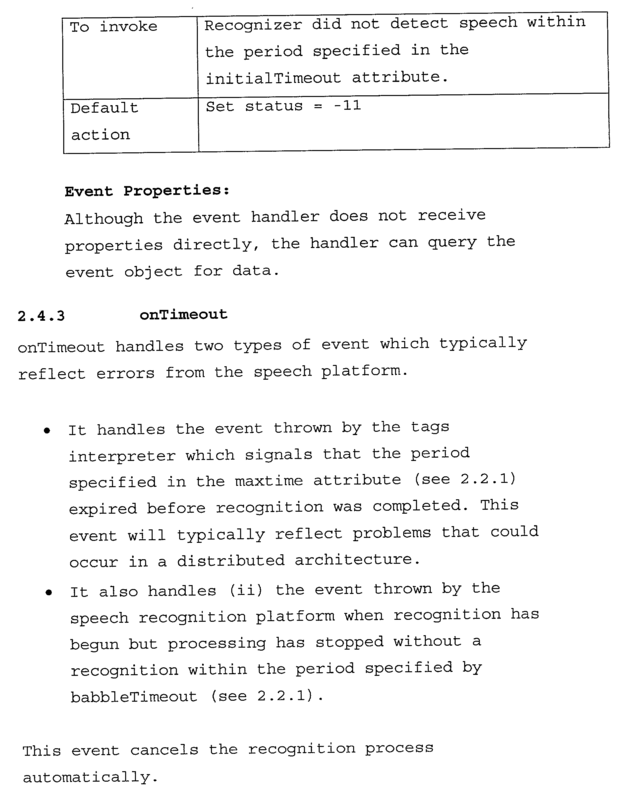 As with all modes of operation, the “onSilence” event 291 is issued if speech is not detected within the “initialTimeout” period 289, but for this mode of operation recognition is not stopped. Similarly, a “onNoReco” event 293 generated by an unrecognizable utterance before the stop ( ) call 305 does not stop recognition. However, if the time periods associated with the “babbleTimeout” attribute 295 or the “maxTimeout” attribute 299 are exceeded recognition will stop. FIG. 14 pictorially illustrates “multiple mode” operation of the recognition server  204. As indicated above, this mode of operation is used for an “open-microphone” or in a dictation scenario. Generally, in this mode of operation, recognition results are returned at intervals until an explicit stop ( )_ call 305 is received or the time periods associated with the “babbleTimeout” attribute 295 or the “maxTimeout” attribute 299 are exceeded. It should be noted, however, that after any “onSilence” event 291, “onReco” event 303, or “onNoReco” event 293, which does not stop recognition, timers for the “babbleTimeout” and “maxTimeout” periods will be reset. Generally, in this mode of operation, for each phrase that is recognized, a “onReco” event  303 is issued and the result is returned until the stop ( ) call 305 is received. If the “onSilence” event 291 is issued due to an unrecognizable utterance these events are reported but recognition will continue. As indicated above, the associated reco object or objects for the field is activated, which includes providing at least an indication to the recognition server  204 of which grammar to use. This information can accompany the speech data recorded at the client 30 and sent to the recognition server 204. 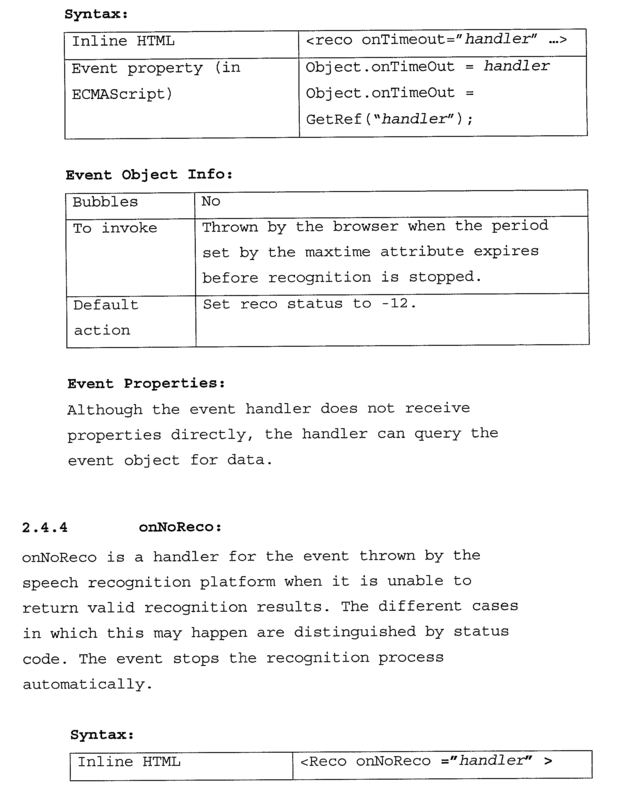 As indicated above, speech data can comprise streaming data associated with the speech entered by the user, or can include pre-processed speech data indicating speech features that are used during speech recognition. In a further embodiment, client side processing can also include normalization of the speech data such that the speech data received by the recognition server 204 is relatively consistent from client to client. This simplifies speech processing of the recognition server 204 thereby allowing easier scalability of the recognition server 204 since the recognition server can be made stateless with respect to the type of client and communication channel. Upon receipt of the recognition result from the recognition server  204, the recognition result is associated with the corresponding field, and client-side verification or checking can be performed, if desired. Upon completion of all of the fields associated with the code currently rendered by the client, the information is sent to web server 202 for application processing. From the foregoing, it should be clear that although the web server 202 has provided code or scripts suitable for recognition to the client 30, the recognition services are not performed by the web server 202, but rather by the recognition server 204. The invention, however, does not preclude an implementation where the recognition server 204 is collocated with the web server 202, or the recognition server 204 is part of the client 30. In other words, the extensions provided herein are beneficial even when the recognition server 204 is combined with the web server 202 or client 30 because the extension provide a simple and convenient interface between these components. While not shown in the embodiment illustrated in FIG. 8, the reco control can also include a remote audio object (RAO) to direct the appropriate speech data to the recognition server  204. The benefit for making RAO a plug-in object is to allow a different one for each different device or client because the sound interface may likely be different. In addition, the remote audio object can allow multiple reco elements to be activated at the same time. FIGS. 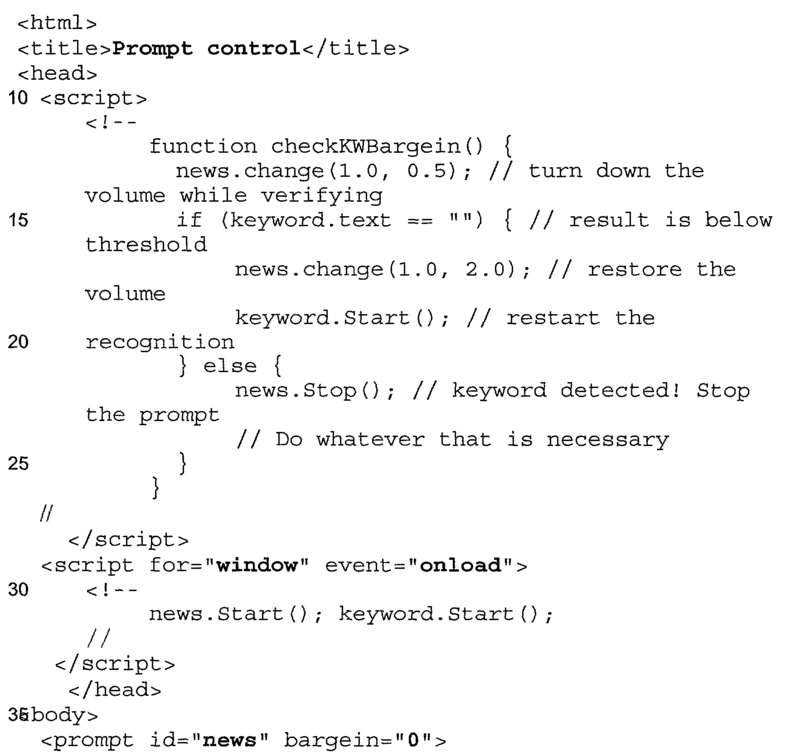 9A and 9B illustrate a voice-only mark-up language embodied herein as HTML with scripts. As clearly illustrated, the code also includes a body portion  300 and a script portion 302. 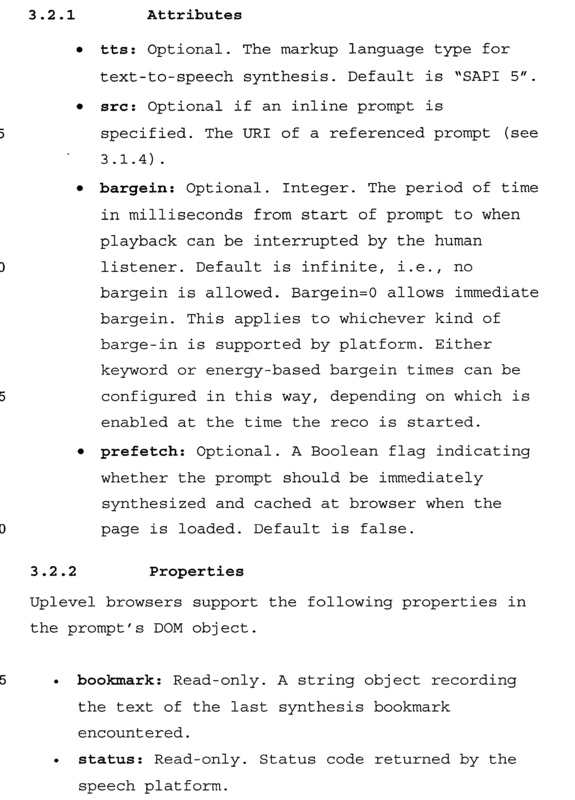 There is another extension of the markup language—prompt control 303 which include attributes like bargein. However, speech recognition is conducted differently in the voice-only embodiment of FIGS. 9A and 9B. The process is now controlled entirely by the script function “checkFilled” which will determine the unfilled fields and activate correspondent prompt and new objects. Nevertheless, grammars are activated using the same context as that described above with respect to FIG. 8, wherein speech data and the indication of the grammar to use are provided to the recognition server 204. Likewise, the output received from the recognition server 204 is associated with fields of the client (herein telephony voice browser 212). 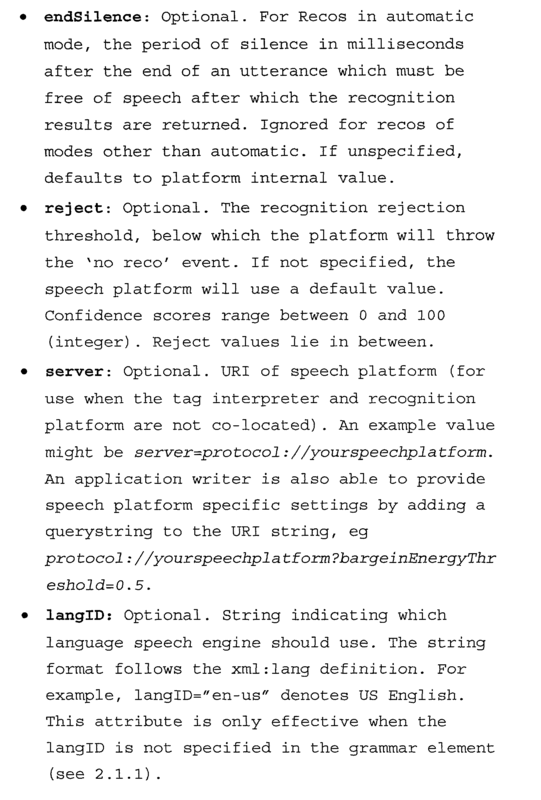 Other features generally unique to voice-only applications is an indication to the user when speech has not been recognized. In multimodal applications such as FIG. 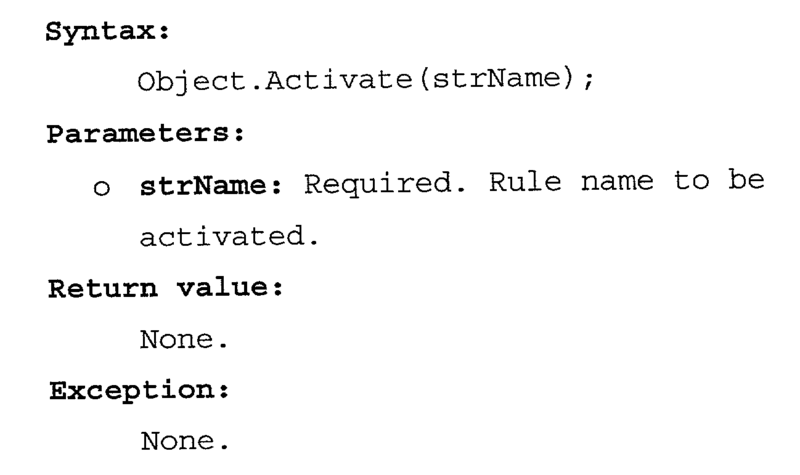 8, ‘onNoReco’ simply puts null value on the displayed field to indicate no-recognition, thus no further action is required. In the voice-only embodiment, “onNoReco”  305 calls or executes a function “mumble”, which forwards a word phrase to recognition server 204, that in turn, is converted to speech using a suitable text-to-speech system 307 (FIG. 5). Recognition server 204 returns an audio stream to the telephony voice browser 212, which in turn, is transmitted to phone 80 to be heard by the user. Likewise, other waveform prompts embodied in the voice-only application are also converted, when necessary, to an audio stream by recognition server 204. It should be noted that in this example after playing the welcome prompt via function “welcome”, function “checkFilled” prompts the user for each of the fields and activates the appropriate grammars, including repeating the fields that have been entered and confirming that the information is correct, which includes activation of a “confirmation” grammar. Note in this embodiment, each of the reco controls is initiated from the script portion  302, rather than the body portion of the previous example. The markup language is executable on different types of client devices (e.g. multimodal and non-display, voice input based client devices such as a telephone) unifies at least one of speech-related events, GUI events and telephony events for a web server interacting with each of the client devices. This is particular advantageous for it allows significant portions of the web server application to be written generically or independent of the type of client device. An example is illustrated in FIGS. 8 and 9A,  9B with the “handle” functions. Although not shown in FIG. 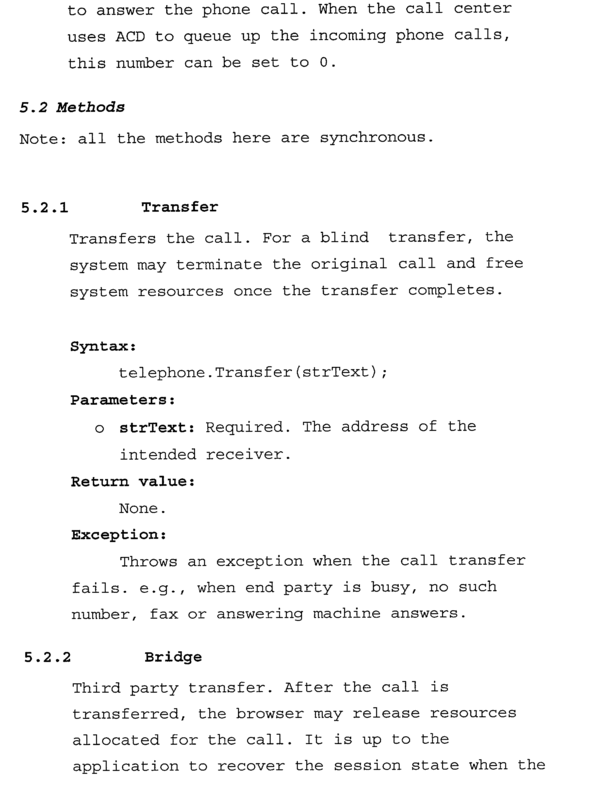 9, there are two more extensions to the markup language to support telephony functionality-DTMF (Dual Tone Modulated Frequency) control and call control elements or objects. DTMF works similarly to reco control. It specifies a simple grammar mapping from keypad string to text input. For example, “1” means grocery department, “2” mean pharmacy department, etc. 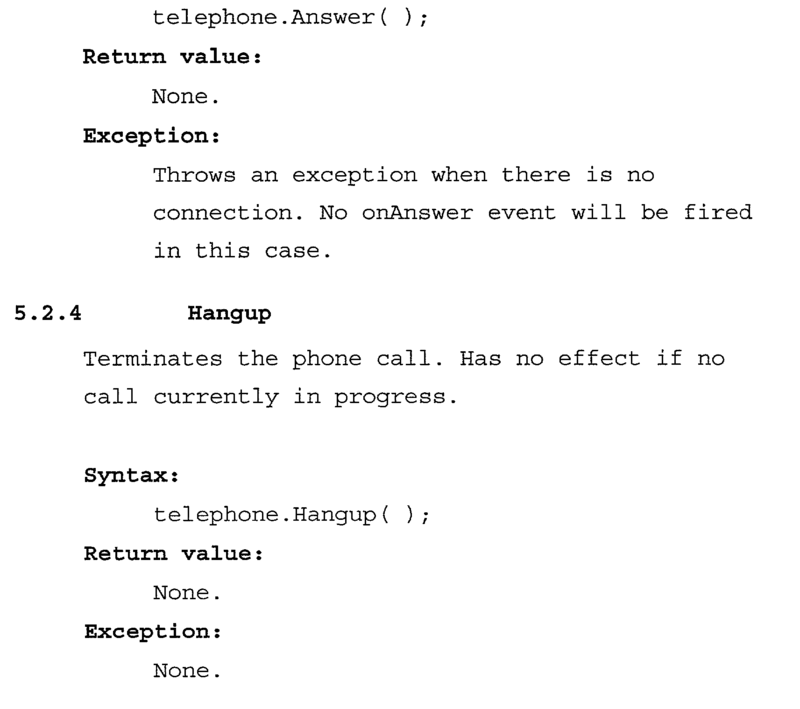 On the other hand, call object deals with telephony functions, like call transfer and 3 rd party call. 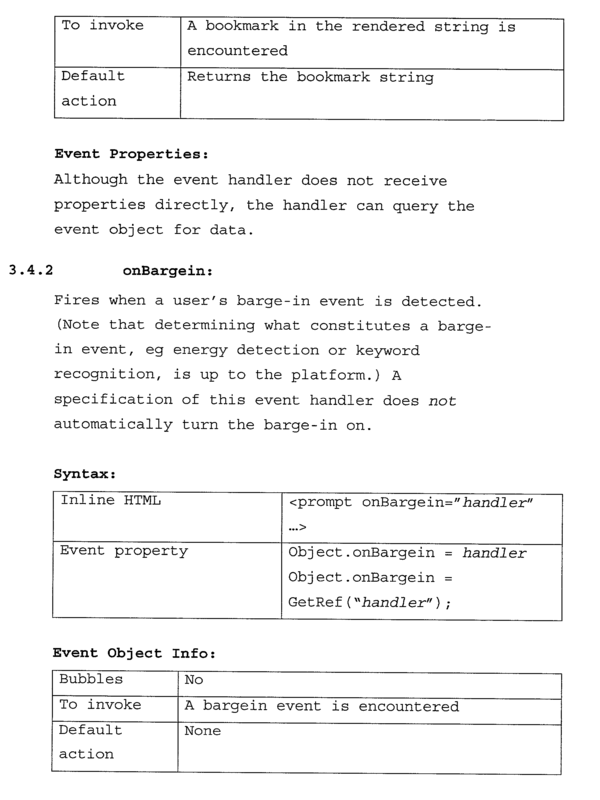 The attributes, properties, methods and events are discussed in detail in the Appendix. In the example of FIGS. 10A and 10B, a grammar identified as “do_field” includes the information associated with the grammars “g_card_types”, “g_card_num” and “g_expiry_date”. 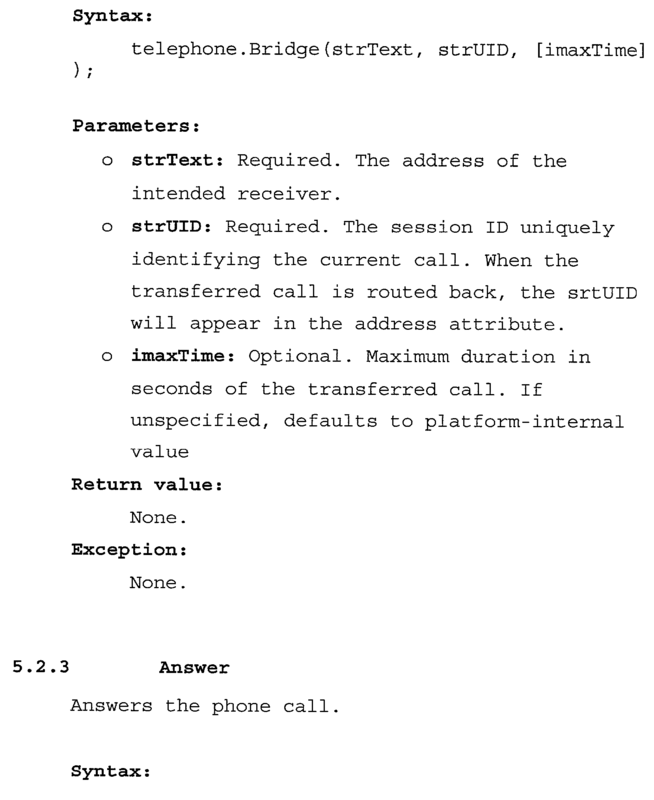 In this example, telephony voice browser  212 sends speech data received from phone 80 and an indication to use the “do_field” grammar to recognition server 204 upon receipt of the recognized speech as denoted by “onReco”, the function “handle” is called or executed that includes associating the values for any or all of the fields recognized from the speech data. In other words, the result obtained from the recognition server 204 also includes indications for each of the fields. This information is parsed and associated with the corresponding fields according to binding rules specified in 405. As indicated in FIG. 5, the recognition server 204 can include a parser 309. From FIGS. 7, 8,  9A, 9B, 10A and 10B, a very similar web development framework is used. Data presentation is also very similar in each of these cases. In addition, the separation of data presentation and flow controls allow maximum reusability between different applications (system initiative and mixed-initiative), or different modalities (GUI web-based, voice-only and multimodal). This also allows a natural extension from voice-only operation through a telephone to a multimodal operation when phones include displays and functionalities similar to device 30. Appendix A provides further details of the controls and objects discussed above. Referring back to FIG. 5, web server  202 can include a server side plug-in declarative authoring tool or module 320 (e.g. ASP or ASP+ by Microsoft Corporation, JSP, or the like). Server side plug-in module 320 can dynamically generate client-side mark-ups and even a specific form of mark-up for the type of client accessing the web server 202. The client information can be provided to the web server 202 upon initial establishment of the client/server relationship, or the web server 202 can include modules or routines to detect the capabilities of the client. In this manner, server side plug-in module 320 can generate a client side mark-up for each of the voice recognition scenarios, i.e. voice only through phone 80 or multimodal for device 30. By using a consistent client side model (reco and prompt controls that can be used in each application), application authoring for many different clients is significantly easier. In addition to dynamically generating client side mark-ups, high-level dialog modules, like getting credit card information illustrated in FIG. 6 with a mark-up examples of FIGS. 8, 9A and  9B, can be implemented as a server-side control as stored in store 324 for use by developers in application authoring. In general, the high-level dialog modules 324 would generate dynamically client-side markup and script in both voice-only and multimodal scenarios based on parameters specified by developers. The high-level dialog modules can include parameters to generate client-side mark-ups to fit the developers' needs. For example, a credit card information module can include a parameter indicating what types of credit cards the client/side mark-up script should allow. A sample ASP+ page using in server side plug-in module 320 is illustrated in FIG. 11.
a recognition server configured to receive the input data and return data indicative of what was recognized to at least one of the client and the web server. 2. The system of claim 1 wherein the information received from the web server and provided to the client device is a markup language. 3. 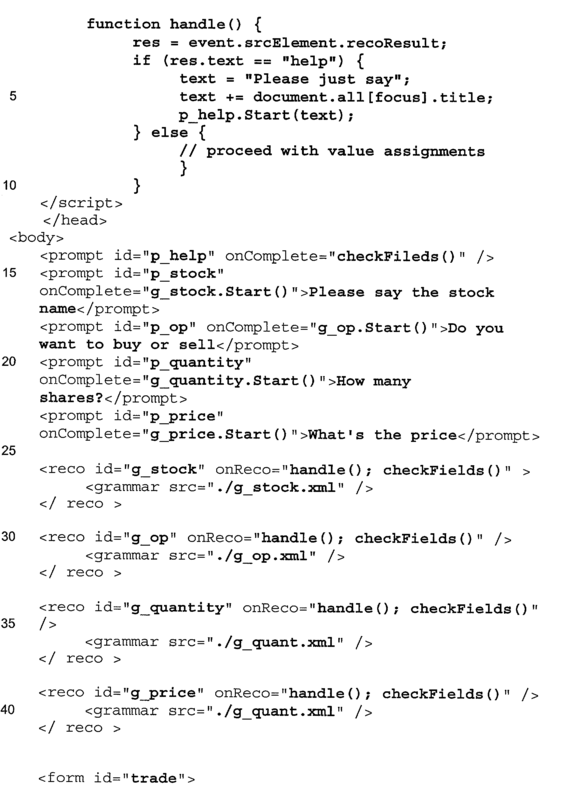 The system of claim 2 wherein the markup language received by the client device comprises one or several markup portions and one or several script portions. 4. 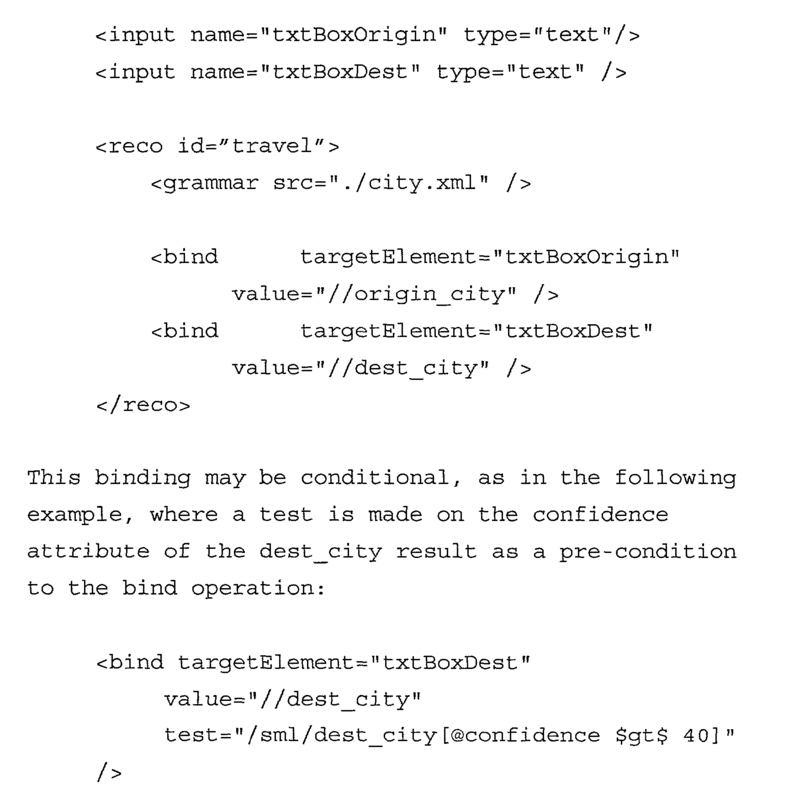 The system of claim 3 wherein the markup language includes an indication associating a grammar with a field. 5. The system of claim 4 wherein the recognition server receives the input data and the indication of the grammar. 6. The system of claim 5 wherein the grammar is stored on the client device and transferred to the recognition server with the input data. 7. The system of claim 5 wherein the grammar is stored on the recognition server and wherein the indication of the grammar includes a reference to the grammar for the recognition server. 8. The system of claim 3 wherein the markup language comprises one of HTML, XHTML, cHTML, XML and WML. 9. The system of claim 1 wherein the client is adapted to normalize the input data prior to sending the input data to the remote server. 10. The system of claim 2 wherein the web server includes a server side plug-in module for dynamically generating a markup language page for the client device. 11. The system of claim 10 wherein the markup language comprises one of HTML, XHTML, cHTML, XML and WML. 12. 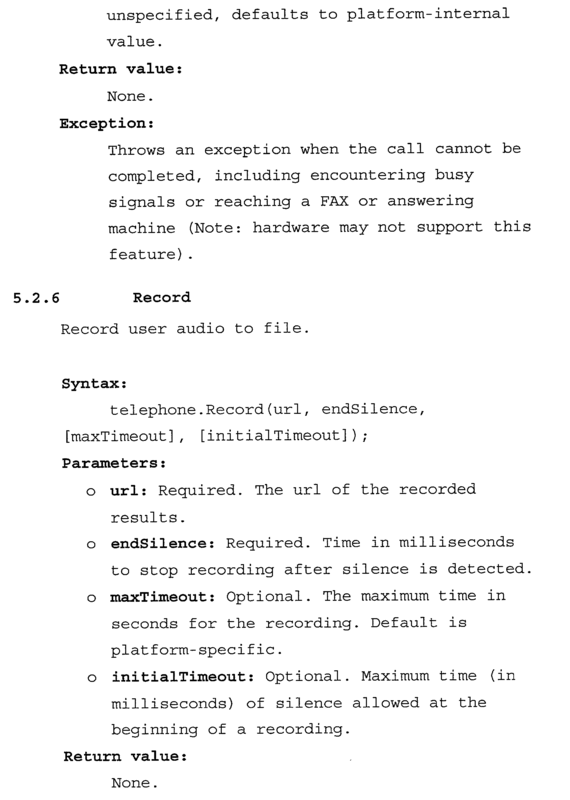 The system of claim 1 and further comprising a second client device having a microphone and a speaker, the second client device configured to record speech data associated with each of a set of fields in response to prompts given to the user, and wherein the second client device is adapted to send the speech data to the recognition server. 13. 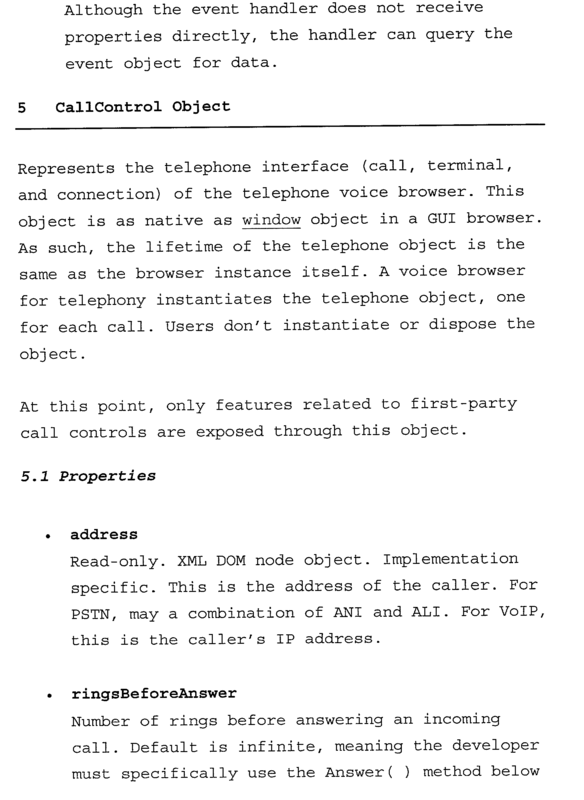 The system of claim 12 wherein the second client device comprises a telephone and a voice browser capable of rendering the contents from the web server. 14. The system of claim 13 wherein the information received from the web server and provided to each of the client devices is a markup language. 15. 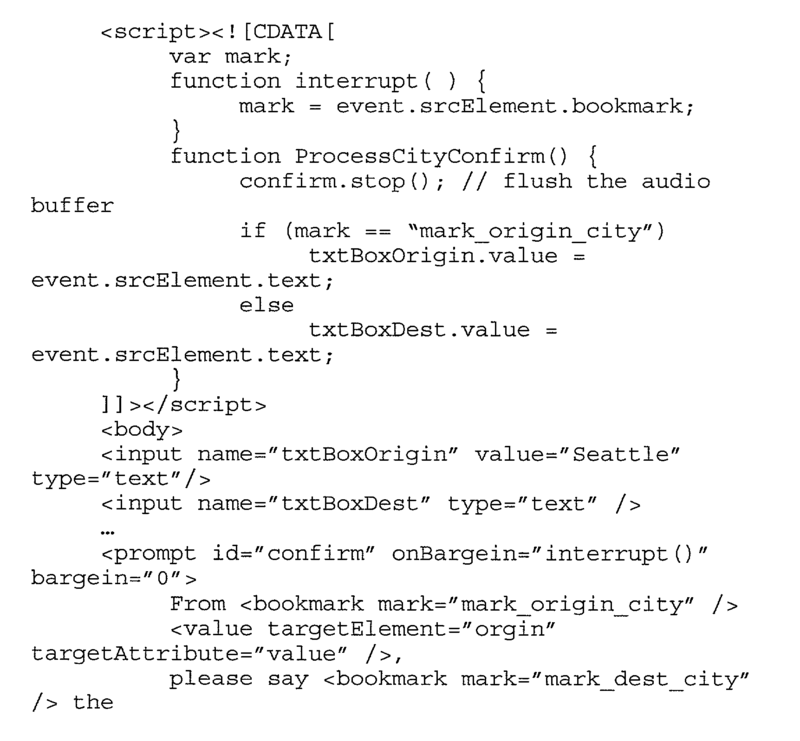 The system of claim 14 wherein the markup language received by the client devices comprises one or several markup portions and one or several script portions. 16. The system of claim 15 wherein the markup language includes an indication associating a grammar with a field, the indication having the same form from each of the client devices. 17. The system of claim 16 wherein the recognition server receives the input data and the indication of the grammar. 18. The system of claim 17 wherein the grammar is stored on the client device and transferred to the recognition server with the input data. 19. The system of claim 17 wherein the grammar is stored on the recognition server and wherein the indication of the grammar includes a reference to the grammar for the recognition server. 20. The system of claim 12 wherein each of the clients is adapted to normalize the input data prior to sending the input data to the remote server. 21. The system of claim 12 wherein the web server includes a server side plug-in module for dynamically generating markup language for each of the client devices. 22. The system of claim 21 wherein the server side plug-in module dynamically generates markup language as a function of the type of client device. 23. The system of claim 22 wherein the server side plug-in module detects the type of client device. 24. 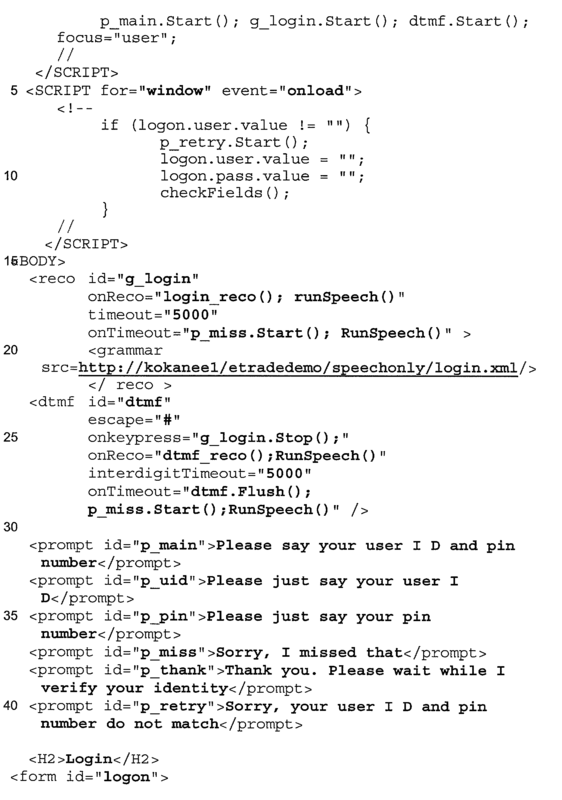 The system of claim 21 wherein the web server includes a plurality of dialog modules accessible by the server side plug-in module, each dialog module pertaining to obtaining data using speech recognition, the server side plug-in module generating the markup language as a function a dialog module. 25. The system of claim 1 wherein the web server and the recognition server are located on a single machine. a recognition server configured to receive the input data and the indication of the grammar, the recognition server returning data indicative of what was inputted to at at least one of the client and the web server. 27. The system of claim 26 wherein the information received from the web server and provided to the client device is a markup language. 28. The system of claim 27 wherein the markup language comprises one of HTML, XHTML, cHTML, XML and WML. 29. The system of claim 26 wherein the grammar is stored on the client device and transferred to the recognition server with the input data. 30. 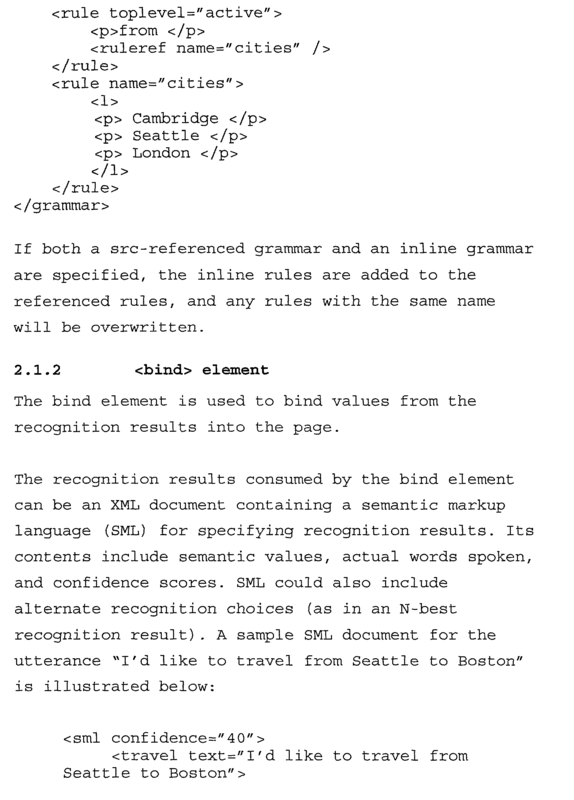 The system of claim 26 wherein the grammar is stored on the recognition server and wherein the indication of the grammar includes a reference to the grammar for the recognition server. 31. The system of claim 26 and wherein the client device comprises a telephone and the rendering component comprises a speaker. 32. The system of claim 26 wherein the rendering component comprises a display showing the fields. 33. The system of claim 26 wherein the client and the recognition server are located on a single machine. receiving a recognition result from the recognition server indicative of what was inputted at at least one of the client device and web server. 35. The method of claim 34 wherein rendering the markup language includes displaying fields for data entry, and wherein obtaining input data includes receiving an indication from the user as to which field subsequent input is associated with. 36. The method of claim 34 wherein rendering the markup language includes audibly prompting the user. 37. The method of claim 34 wherein the markup language comprises one of HTML, XHTML, cHTML, XML and WML. 38. The method of claim 34 wherein transmitting the indication of the grammar comprises transmitting the grammar. 39. The method of claim 34 wherein transmitting the indication of the grammar comprises transmitting a reference to the recognition server as to where the grammar is located.